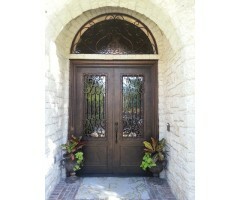 The styling on this double entry door is exquisite to begin with. 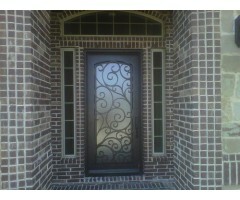 After we added the custom iron design to the glass and complimented this with upper corner detail of the door frame, then literally topped it all off with a coordinated design to complete the rectangular and half round windows above the door. - Grandiose!!! .. 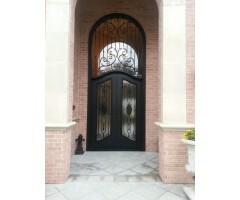 This 2 piece grand entrance door is a designer's dream for creating a first impression! The time and detail put into this creation was well worth the final result. Using consistency with a hint of Art Nouveau produced a magnificent impact on this luxury home. 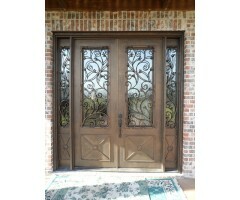 ..
Vine and leaf tipped scrolls are the theme of this four unit double entry door. 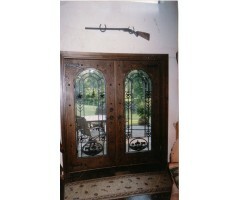 The lower solid panels were framed and crossed with the Texas Lone Star proudly centered on each one. .. This obscured glass double door was designed with a pleasing display of scrolls in front of the glass, and also on the lower solid portion of the door to compliment the upper window. .. 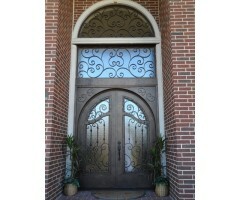 This design was created to accentuate the height of the door and window. 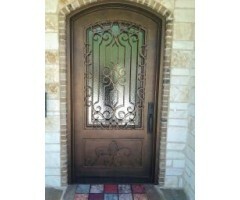 With the single center design on both doors accented with an oval medallion. The upper window having top and bottom scrolls tied together with the added interest of collared vertical bars. .. The large open scrollwork on the upper arched window compliments the double door's tighter scrollwork with vertical bar accented in a simple collar for visual dimension. .. 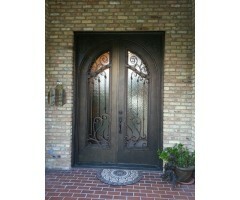 This visual delight double entry door is the perfect way to add value and beauty to your home. With it's trim work and upper corner details your family and guests will be greeted with style. .. 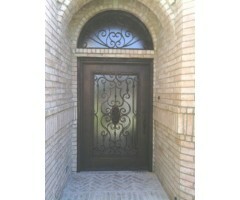 This is a beautiful door using privacy glass behind the artistic iron design and dressing up the lower solid panel with a centerpiece iron design. .. The owner of this country gentleman's ranch designed his home around Native American history. We personalized the iron inserts for his rustic double doors adding forged iron nail heads and hinges for added authenticity, creating inserts complete with cattle ranch scenes at the lower section and a border to tie the theme together through arrows and country stars. .. This beautiful arched window door is complete with privacy glass adorned in classic ironwork to compliment any style, and an iron centerpiece on the bordered lower panel. .. 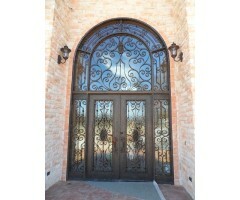 This extreme grand arched entry is making a beautiful statement with this 6 piece artistic iron door and window detail. 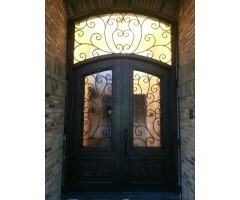 ..
Privacy glass with large flowing scrolls created a romantic elegance to this home's entrance. ..